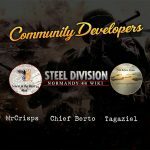 The making of Steel Division: Normandy 44 required more than 70 people from Eugen Systems, and we would like to share the work and views of our teams from the concept artists to the developers. As we will release the first major balance update “And justice for all” tomorrow, we decided to present this week our Game Design department and their tremendous efforts to provide interesting rules, good balance, and a authentic atmosphere to the game. Today, we welcome Stephan, our Lead Game Designer. Hi Stephan, can you introduce yourself? My name is Stephan Hernandez. I’m a Lead Game Designer at Eugen Systems. I’ve been working here since 2004, at the time I was hired to work on Act of War, Eugen’s third game which brought the company out of the shadows. As a Lead Game Designer in a relatively small structure, I have two roles. My job consists in thinking about the main concepts of a new game with our Creative Director Alexis Le Dressay, among others, and doing the prototyping. I’m also responsible for the Game Design: I coordinate people from the Game Design team of course, but also from Level Design, and some of our QAs depending on the period. How many people are working in the Game Design team? Do you have specialties? Currently, there are seven people in the Game Design team. In general, we want the members of our team to be versatile, but each of us can have preferences. Some of us are more comfortable with Level Design, while others prefer to create units, improve the overall balancing between divisions or work on some particular projects or features. Nevertheless, as a small team, we have to be at ease with everything. What was the job of the Game Design team in the production of Steel Division: Normandy 44? 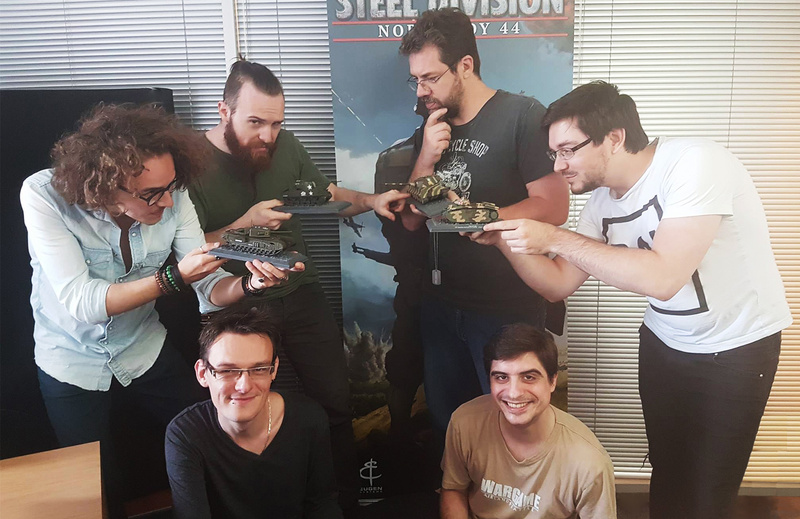 First, we created and tested a prototype for Steel Division: Normandy 44. We used Eugen Systems’ tools to create a Tactical RTS with a WW2 atmosphere, and new, innovative rules. The overall idea was quickly validated. The second phase was the production of Steel Division: Normandy 44. We worked with the Production Team to determine what could be attractive to the players. When and where should the game take place? What content should be integrated? What should be its most important features? So, we had to think about all this content and respect the deadlines: 15 maps, three solo campaigns, 18 divisions, 400 units… It was a colossal task. Finally, now that the game is published, we are continuously working on improvements and updates. The slightest change can have consequences on the Game Design, and the game can quickly become unbalanced or unplayable. For example, a slight modification in the AI behavior can transform the whole single-player campaign experience! This project is challenging to handle because it includes a lot of units and various divisions. The first step was the creation of the maps and divisions, then making sure they were balanced in each mode: Destruction and Conquest, from 1v1 to 10v10. The most important thing was to validate the Multiplayer before moving forward because it required a lot of testing and changes. We fought many battles! Regarding the maps, we used real RAF and USAF aerial material and took a look at the most interesting battles. We didn’t choose these localizations by accident, but we picked them according to their multiplayer gameplay potential. Why use this bocage, this road, this village instead of the same configuration a few kilometers away? Each map had to give the players good lines of sight, logical and fair distances between the point of departure and the point of arrival, many roads… in a word, lots of possibilities and liberties. Clearly, if we had chosen the maps randomly, it wouldn’t have worked. We tried and tried every game version until the release and changed the maps if necessary. It was a huge challenge because each one of the maps needed to be based on both reality and exciting gameplay. 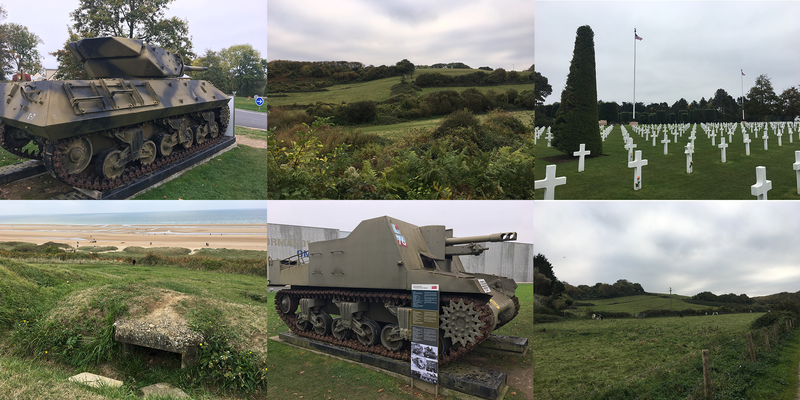 I went to all the places depicted in Steel Division: Normandy 44 while I was on vacation. I saw the bocages and understood how the topography influenced any battle’s outcome. To create the divisions, we worked a lot with the Production Team and particularly Matthieu ‘MadMat’ Brevet. He gave us a list of divisions that fought in Normandy at that time with the types of units they used from infantry to tanks. Based on his work, we adjusted them according to our realistic direction while changing some things to make the game enjoyable. Indeed, every division had to be different, with its own gameplay. It involved specific units, specific unit’s prices, balancing according to the Phases… While respecting History the best we could! We didn’t want to give too many units to all divisions because, in the end, they would have looked all the same. 400 different units was already a huge number, there were not so many more units in Normandy. Creating 18 divisions was a choice because we knew that each one of them would be played in a different way according to their Phases, the maps, or the mode. When we started to work on units, we mainly used our culture and our experience in Real-Time Tactical game production to give initial values to every unit (experience, precision, price, etc.) and we tested them again and again in-game. Then, when the game went to Beta, we analyzed multiplayer battles’ data and useful feedback to identify the main problems and balance the game afterward. For a small team, this work was, and still is, mind-blowing. Designing the 10v10 battles was different. It is the synergy that prevails over balancing. Players have to communicate, and at this scale, it is not the equipment that makes the difference but the doctrine. How did you build the single-player campaign? We decided to go with a sequential single-player campaign, with a scenario, because of the many feedback we had. Mission by mission, campaign by campaign, we wanted to guide and help the player to learn the game, from its basics to its most subtle mechanics. It was meant to be the logical successor of the Boot Camp, scripted but with more and more liberty as the player becomes a real strategist. We made the choice of a quality product with an original and exciting setting over quantity and repetitive missions. A strategic and dynamic campaign with this level of quality was impossible to make. The persistence was also very important to us: the loss management was a challenge that we liked. Every death matters. Also, the campaign had to represent the overall game’s experience, like the sense of urgency. What do you do now that Steel Division: Normandy 44 is released? How do you intend to improve it? Before the release, we worked on many things at the same time. Now, we can focus even more on balance. Since the Beta, we’re regularly releasing tuning patches, an activity which takes us about 50% of our time. The game is not perfectly balanced, and it’s hard to say if it can be, but we hope to achieve this goal. To do so, we analyze the players’ feedback, understand the necessary changes and compile the statistics. We also watch online replays from tournaments for example. We also simulate the problems by playing ourselves. Every division must be enjoyable. We don’t want to have one OP strategy above all that would kill all the fun. What was the most interesting part of working on Steel Division: Normandy 44? The hardest? For me, creating a game from scratch is a general good feeling. Retrospectively, there were some difficult things and easy things to do. The maps were ‘simple’ because we had the experience, and even if new constraints appeared (the bocage for example), each location had tactical specificities. I like Sainte-Mère because I played a lot on it during the prototyping, and Mont Ormel because you have new opportunities with the relief, you have to play differently, reasoning in 3D. The creation of the solo campaign was hard because of its Level Design. Players need to learn tactics without feeling it and have fun. It’s like going to school while having the impression to go to a vacation camp. 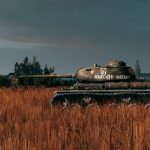 Why is Steel Division: Normandy 44 a unique production compared to other Eugen Systems’ creations? 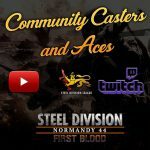 Steel Division: Normandy 44 as a unique game flow, following a loop “Analyse-Decision-Execution” like no other RTS. You are in a real strategist’s shoes. 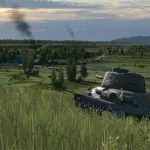 To analyze what’s going on on the battlefield, you can count on the Dynamic Frontline to anticipate where the threats are, to see the enemies weak points to encircle them, or if your ally is in danger to help him very quickly… In Steel Division: Normandy 44 you make decisions like in a chess game: you anticipate your enemy’s moves to plan yours in advance and send your reinforcement in the right direction. Finally, you have access to a wide range of different actions. Many tools as the line of sight and the shift key can help you manage your units. All theses mechanics are like a watch on your wrist. They form a very complex system, but you end up forgetting that they’re even here. You keep using them, and they become vital! This work is hard because if it isn’t done right, your game will be too slow or on the contrary, you will have too much micromanagement. 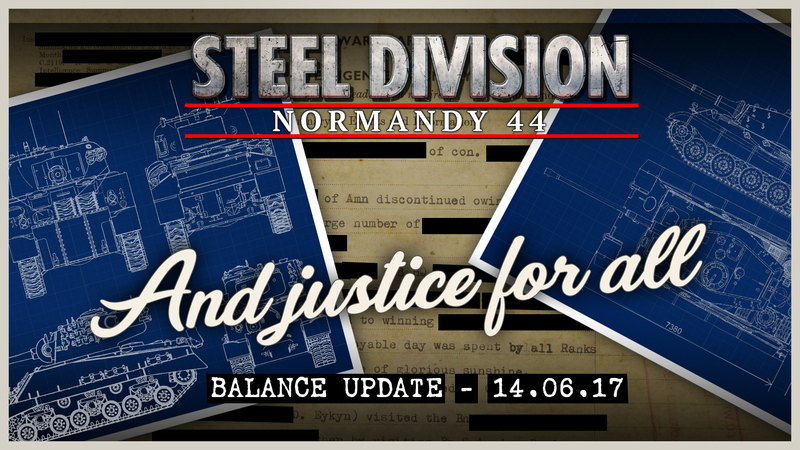 In Steel Division: Normandy 44, the balance between Analyse, Decision and Action exists. When you play Steel Division: Normandy 44, you feel like it’s realistic, authentic, natural. It’s a huge work, like building a clock with hundreds of invisible pieces. If one mechanic doesn’t work, everything falls. If one unit type works poorly, the all game is affected. 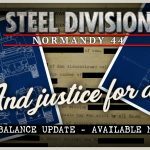 What we’ve achieved in Steel Division: Normandy 44 is to create a whole interconnected system: all units and mechanics communicate with each other and in a well-oiled loop. But this strength which makes the game so special could also be its weakness. 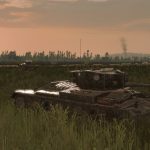 Steel Division: Normandy 44 is unique because it was thought like a clock mechanism: it has highlights and rest time, introduction and conclusion, like a symphony or a movie. The 3-Phase system, for example, is like a theatrical play. Phase-A is the expository scene, you discover the plot and position your units. Then in Phase-B, the pace quickens, the player has to react to unexpected plot twists. In Phase-C, the game rises to its climax, then the pace slows down and finally, the conflict gets solved. In the video game industry, success is the exception. Sometimes, taking risks don’t pay, these mechanics and the overall pacing don’t work as we wished. Our small team had to count on its experience and its passion in order to achieve success. We also had to be self-critical to renew our productions and never rest on our laurels. Most of our Game Designers. The hole Team is making a great Job! Keep on the good work, with SDN you have made an awesome new lvl rts, thank you very much i fell in love with it ;D !